The Philadelphia Dental College Collection was transferred to the University Archives from the School of Dental Medicine Library (Accession Number 2015:018, May 2015). 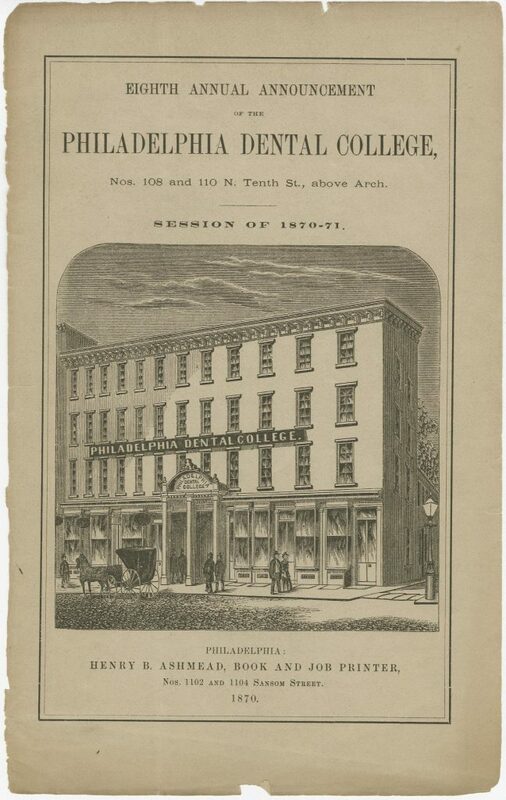 The Philadelphia Dental College Collection is arranged chronologically by publication year. The Philadelphia Dental College was founded in 1863 as the second oldest school of dentistry in the United States. In 1878 the College opened the Garretson Hospital for Oral Surgery, which was the first hospital to specialize in oral and maxillofacial Surgery. The campus for the Philadelphia Dental College was located at Eighteenth and Buttonwood Streets. In 1877 a committee from the University of Pennsylvania (which decided to establish a dental department of its own) approached the faculty of the Philadelphia Dental College to propose a merger. The faculty officially declined the offer. The Philadelphia Dental College continued as an independent school until its merger with Temple University in 1907. The Philadelphia Dental College retained its name until 1913, when it was renamed the Temple University School of Dentistry. Today it is the Kornberg School of Dentistry. The Philadelphia Dental College Collection consists primarily of an incomplete run of published announcement from the school between 1869 and 1906. In addition, included are a photograph of a graduate, and a commencement invitation. Philadelphia Dental College and Hospital of Oral Surgery.. Announcement. Callahan, John R., Jr (1853-1918) Class of 1877 n.d.